Want to Start PreSchool | Start Y our Own Playschool A playschool is meant for kids under the age of 5 and is primarily aimed at providing quality education for kindergarten kids. So if you love kids then starting a playschool may be a good idea. 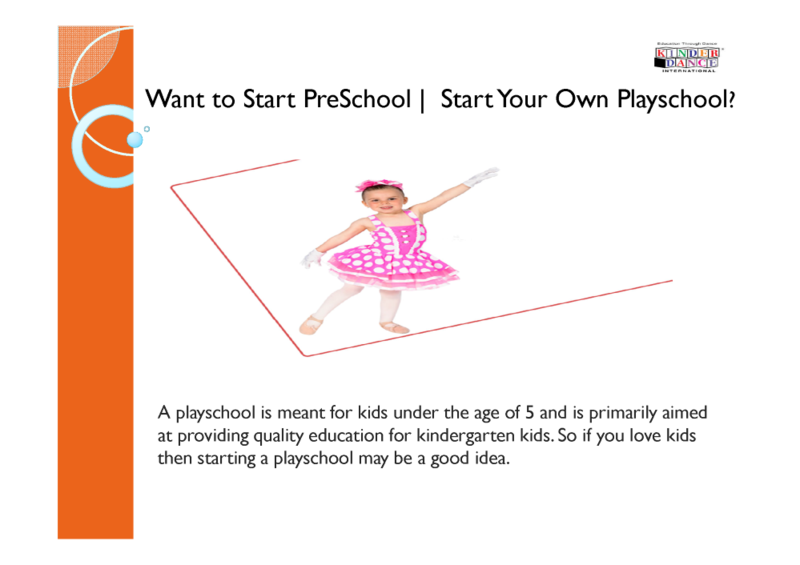 For choosing a good curriculum you can get the advice of playschool consultants pre-school teachers or owners of established playschools. - Kinderdance programs blend educational concepts with various forms of movement dance and gymnastics. The programs help develop gross motor skills movement creativity fitness and body awareness. Each class is taught using lesson plans which incorporate original and traditional age- appropriate music and songs. Kinderdance offers 6 programs specially designed for children aged 2 - 12 years. Kinder Dance with Me® 15 - 24 Months Its curriculum offers age appropriate exposure to developmental milestones through dance and sensory-motor activities while nurturing the bond between caregiver and child. Caregivers participate and learn to facilitate the natural exploration and progression of motor development through play laying the groundwork for academic success as the child grows. Kindertots® age 2 is designed to develop the total child through gross motor skills movement creativity physical development and body awareness while learning numbers colors shapes and songs. Kinderdance® ages 3-5 is a developmental dance motor development and fitness program taught on 3 levels teaching the basics of Ballet Tap Acrobatics and Creative Movement while blending educational concepts. Kindermotion® ages 3 -12 is a developmentally designed education through motor skills physical development fitness nutrition and imagery program which prepares students minds and bodies for athletic and academic pursuits. Kindercombo® ages 6 - 8 is a developmentally designed combination Ballet Tap Modern Dance and Fitness program. This gives the young dance student a healthy and solid foundation upon which to build.